From business functions to wedding receptions, anniversaries and more, celebrate on a scheduled trip or charter the whole train for the party of a lifetime. Whatever the occasion, we provide everything you need for the perfect journey. And our fresh seasonal dishes—expertly paired with fine wines and champagnes—are sure to impress. 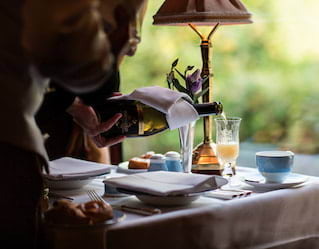 What could be a better staff incentive than a trip aboard the iconic Belmond British Pullman? Dazzle colleagues or clients with your own branding onboard and at the check-in lounge. Make a lasting impression with custom menus incorporating your company’s logo and a special welcome message. Entertainment, both on the platform and aboard the train, can be arranged to add that extra sparkle to your event. Bring friends together for an exceptional day out on the rails. 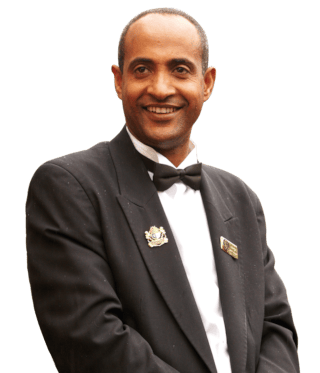 Your event will be tailored to suit you, with departures themed to your interest and special menus brimming with delicious artisanal treats. Depending on the size of your party, we can also create a custom route with pick-ups from your chosen station—the perfect bespoke event. A member of this fantastic team for decades, I can’t imagine working anywhere else! Generations of the same family work onboard the train. Take the Leggs—Michael, who has been with us over 20 years, is now joined by sons Thomas, Richard and, occasionally, Harry; his youngest daughter, Marianna, has also previously worked onboard.